Macanudo Court Cafe delivers smooth, mellow, and classic flavor in a 4 1/4 x 36 Small Panetela vitola. the mellow flavorfull well made cigar is a classic.nice aromatic taste is enhanced by cedar lining in the tube. Great value! my go-to cigar...when you don't have an hour, just maybe half an hour. mild, tasty smoke. great with coffee in the am. excellent small smoke...when you don't have an hour to enjoy. good buy. 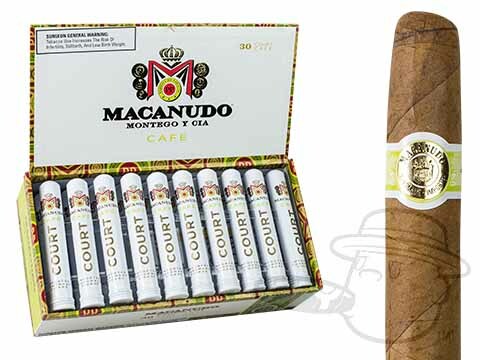 The Macanudo Court Café is an excellent small cigar with great taste an aroma . You will not be disappointed to smoke. Excellent cigars at a reasonable price . They draw easy have nice mild flavor and aroma. Very nice light cigar, love it one of my favorites. The Macanudo Court Café is has excellent taste and aroma. You will not be disappointed to smoke. As always cigars were fresh. Mild flavor, even burn are two enjoyable features of this classic cigar. Good cigar for a couple holes on the golf course or a quick smoke at the beach. These are my all time favorite. We don't smoke in the house so these are perfect for when piddiling around in the yard or shop. Great ring size and always a good draw. This cigar is great, but the prices have gone up recently. Macanudo Court Cafe Tube is rated 4 out of 5 based on 36 customer ratings. Do these cigars need to be in a humidor? Hello Javier! It is recommended that you keep all cigars in a humidor, even if they are in tubes. This way you're sure to keep your cigars fresh at all times.